Some Aromatherapy Basic Recipes To Try Using Your Essential Oils. Try some aromatherapy basic recipes to get yourself started........and then you will be hooked! Once you discover how easy and rewarding it is to create natural recipes using your essential oils and other ingredients - sometimes something as simple as water - then there will be no stopping you. Why create your own aromatherapy basic recipes? Well for starters you can control the ingredients you are using...and ensure that no harmful chemicals are being used around you and your home. That alone could be a good enough reason, but I think you will also find it is a lot of fun, saves you money and gives you some great gifts to give to family and friends. It is a good idea to start gathering together some equipment.....but remember it doesn't have to be expensive! All types of bottles and tubs can be bought inexpensively from aromatherapy sites or pharmacies...... or you can even wash out your old lotion and spray bottles. Start keeping pretty jars, bottles and tubs with tight-fitting lids. It's a great way to recycle and be even more green with your aromatherapy basic recipes! Using bath salts are a fantastic way to unwind and de-stress. Salts usually used are Epsom salts or sea salt which come in different sizes from fine to coarse.....so why not experiment and decide which you need or like the best. Stir the essential oils into the salts. Pour the mixture under the running tap into the bath and mix well.... it's best to wait until the bath is nearly full so that you get the full benefit of the oils. Step in, relax and enjoy.....! You will need: A plastic bottle - preferably with a pump. Fill up your bottle with your choice of carrier oil. I like to use sweet almond oil because it is suitable for all skin types and feels nice and velvety, but grapeseed oil, avocado oil and apricot kernel oil (or a mixture!) would be suitable. For every 100ml of carrier oil add 10 drops each of rosemary, black pepper and lavender. After showering massage the aromatherapy blend into your body. The wonderful aroma will stay with you for the rest of the day! Keep Wardrobes and Drawers Smelling Great. Put a few drops of your favourite essential oils on cotton wool balls and place them in your wardrobes and drawers. I like to use lavender and lemon because it also helps to keep the moths away! Do you worry about the CFC's in your aerosol and what they are doing to the health of you, your family and the planet's ozone layer? Well, using essential oils is the natural and far healthier approach to use......and once you have I am sure you will never want to use a commercial air-freshener again! Fill a plant spray bottle with distilled water and add around 10 drops of lovely fresh lemon or lavender to every 300ml. Spray as finely as you can into the air, making sure you avoid any good wood....you don't want any stains! If you have pets you may want to concentrate the spray towards the carpet and curtains. Diffusers are designed especially for essential oils and are simple to use and very easy to buy. They heat up the oils either by electricity or by candle so that the molecules are released ino the air. The important thing to remember is to wipe the bowl clean after every use. You can buy special rings for use with lightbulbs. However it is possible to add essential oil directly to a standing lightbulb. You must do this when the bulb is switched off and cool (remember essential oils are inflammable!) and be careful only to use 1 or 2 drops for each bulb. 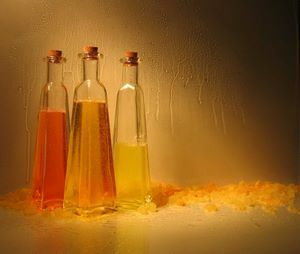 So....starting with some aromatherapy basic recipes is a good way to experiment and be creative in a simple and inexpensive way. It may be a good idea to keep notes on the recipes you are making, so that you know whch blends you like and what quantities you are using.....you may want to modify, and being organised will help! Have fun using natural and healthy ingredients........and please keep coming back to check on any new recipes as I will be adding them on a regular basis!